Dark matter may be collecting in the center of the Earth. A recent paper explores way to detect its decay products here on the surface. Dark matter may collect in the Earth and annihilate in to dark photons, which propagate to the surface before decaying into pairs of particles that can be detected by a large-volume neutrino detector like IceCube. Image from arXiv:1509.07525. Our entire galaxy is gravitationally held together by a halo of dark matter, whose particle properties remain one of the biggest open questions in high energy physics. One class of theories assumes that the dark matter particles interact through a dark photon, a hypothetical particle which mediates a force analogous to how the ordinary photon mediates electromagnetism. These theories also permit the ordinary and dark photons to have a small quantum mechanical mixing. This effectively means that the dark photon can interact very weakly with ordinary matter and mediate interactions between ordinary matter and dark matter—this gives a handle for ways to detect dark matter. While most methods for detecting dark matter focus on building detectors that are sensitive to the “wind” of dark matter bombarding (and mostly passing through) the Earth as the solar system zooms through the galaxy, the authors of 1509.07525 follow up on an idea initially proposed in the mid-80’s: dark matter hitting the Earth might get stuck in the Earth’s gravitational potential and build up in its core. These dark matter particles can then find each other and annihilate. If they annihilate into very weakly interacting particles, then these may be detected at the surface of the Earth. A typical example is dark matter annihilation into neutrinos. In 1509.07525, the authors examine the case where the dark matter annihilates into dark photons, which can pass through the Earth as easily as a neutrino and decay into pairs of electrons or muons near the surface. 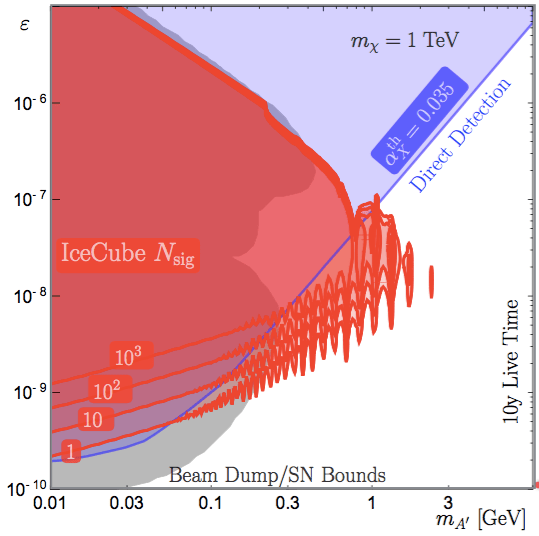 Number of signal dark photon decays expected at the IceCube detector in the plane of dark photon mixing over dark photon mass. Image from arXiv 1509.07525. Blue region is in tension with direct detection bounds (from ariv:1507.04007), while the gray regions are in tension with beam dump and supernovae bounds, see e.g. arXiv:1311.029. While similar analyses for dark photon-mediated dark matter capture by celestial bodies and annihilation have been studied—see e.g. Pospelov et al., Delaunay et al., Schuster et al., and Meade et al.—the authors of 1509.07525 focus on the case of dark matter capture in the Earth (rather than, say, the sun) and subsequent annihilation to dark photons (rather than neutrinos). The annihilation rate at the center of the Earth is greatly increased do to Sommerfeld enhancement: because the captured dark matter has very low velocity, it is much more likely to annihilate with other captured dark matter particles due to mutual attraction from dark photon exchange. This causes the Earth to quickly saturate with dark matter, leading to larger annihilation rates than one would naively expect in the case where the Earth were not yet dark matter saturated such that annihilation and capture occur at equal rates. In addition using directional information to identify signal events against cosmic ray backgrounds, the authors identified kinematic quantities—the opening angle of the Standard Model decay products and the time delay between them—as ways to further discriminate signal from background. Unfortunately their analysis implies that these features lie just outside of the IceCube sensitivity to them. Finally, the authors point out the possibility of large enhancements coming from the so-called dark disk, an enhancement in the low velocity phase space density of dark matter. If that is the case, then the estimated reach may increase by an order of magnitude. “A poor particle physicists’s for neutrinos from dark matter annihilation in the sun,” provides a concise summary of the formalism for calculating dark matter capture rates. “Beyond Collisionless Dark Matter,” shows how dark matter self-interactions (such as the one mediated by the dark photon) can solve small scale structure problems in astrophysics. David Morrissey’s 2013 Perimeter Institute Lectures on Dark Matter (video lectures) are an excellent introduction to the general field of dark matter.